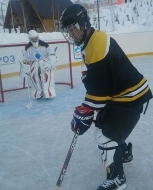 The first ever ice hockey game in Tajikistan took place on January 8th, with the debut match taking place between Safed Dara and Farozom at the Safed-Dara resort. Not many details of the game are known, but from shared footage online, it appears as though the game featured five players at each end, with one player each playing goalie in player equipment. With a population of about 8.208 million, the cold country is surrounded by China, Kyrgyzstan and Uzbekistan, who all have hockey programs of their own. Tajikistan was supposed to be apart of the bandy portion of the 2011 Asian Winter Games, but the team had to back out prior to the tournament. The city of Khujand has a rink, even though the game wasn’t played there. The rink measures at 30mx40m, much smaller than the official IIHF-required rink size of 61mx26m. The organizers of the first game, Safed-Dara, were trying to put a team together for a game on January 21st, but just posted footage of their second recorded game on January 29th.